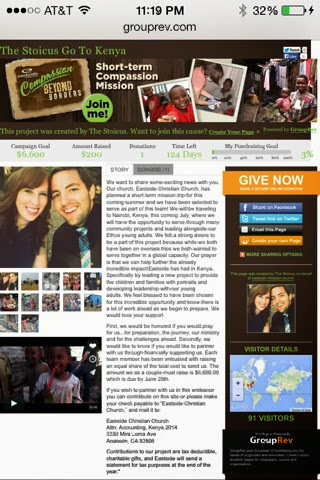 Charles and I are really excited to go to Kenya this summer with Eastside. I went in 2007 and somehow have not been back. Charles has traveled to Australia and Thailand for other mission trips. We both wanted to embark on another journey and thought it would be great to do this together in our first year of marriage. I decided I wanted to pursue Kenya specifically after a conversation with Arty (the Kenya team leader). I was telling him about a project I wanted to do locally for the community and he almost instantly said, "Let's do that in Kenya!" He had been wanting a new project for the community and this felt just right (I'll explain the project in a minute). I told Charles about the conversation and he was excited about taking the journey to Kenya as well. Christ. It may seem small but I think God can use it in big ways. Also, we found out quite a few young adults were signing up for Kenya. This was exciting since we've been leading Ethos, the young adult ministry. We're stoked to serve alongside them and support them on this journey as well as the many other team members of all ages and points in their journey. Anyway, if you want more info or want to support our journey you can check out our Kenya 2014 page (http://grouprev.com/thestoicus) or send over questions. We'll update more along the way. Thanks for journeying with us through reading about this.